Suppliers are generally required to make available information relating to articles supplied to ensure that when put to proper use they are safe and without risk to health. 1. They are used for the purpose for which they were designed. 2. They are not loaded beyond their rated Working Load Limit. 3. They are properly maintained. 4. They are inspected regularly and tested in accordance with the relevant statutory regulations. 5. They are used by competent persons trained in their use. Our products are marked with a WORKING LOAD LIMIT which MUST NOT be exceeded. The manufacturer does not accept any liability for damage which may result from the product being used in excess of the Working Load Limit. Ensure that existing endstops on runway beams will accommodate SuperClamp™ Trolleys. On occasion, we supply replacement component parts for SuperClamp™ models, but we do not accept any responsibility for these unless they are installed by a person with appropriate knowledge and training and the statutory tests and inspections are carried out on completion of repair. Unless we are informed at time of inquiry and order about particular hazardous environmental conditions, all equipment is supplied on the assumption that it will be used in normal atmospheric and temperature conditions as applicable within the contiguous United States. This is the maximum load which can be applied to the product in service. It is of the utmost importance to health and safety to ensure that SuperClamp™products are only attached to structures, materials or other lifting components which are authentically and authoritatively approved and recommended to carry or sustain the working loads to be applied. All of our products exceed the provisions of OSHA 29CFR Parts 1910, 1918, 1926 and ANSI B30 as applicable. Our contribution to SAFETY is in securing the QUALITY and RELIABILITY of our SuperClamp™ products. 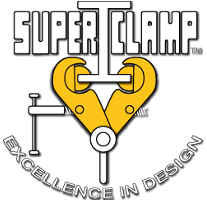 Each SuperClamp™ product is proof-tested to twice the Working Loads Limit, unless otherwise stated or required by authoritative recommendations. Tests to destruction, ensuring a 5:1 factor of safety, are employed throughout the design, development and manufacturing process of our products, where required.